Boston's theater community gathered last night at the newly restored Paramount Theatre for the 2010 Elliot Norton Awards. Recognizing excellence in Boston theater, the awards are presented annually by The Boston Theatre Critics Association. In a nod to the Tonys , the festivities included musical numbers from the three nominees for Outstanding Musical Production. The evening kicked off with the sassy "Masquerade" from "Phantom of the Oprah" by the Gold Dust Orphans. Selections from "Adding Machine: A Musical" (SpeakEasy Stage) and "Best of Both Worlds" (A.R.T.) followed, with "Adding Machine" ultimately walking away with the prize. Among the top winners of the night: SpeakEasy Stage with a total of five awards covering "Adding Machine" and "Savannah Disputation;" Elevator Repair Service with three for their production of "Gatz" at the A.R.T; and Publick Theatre, which took home two awards for "Entertaining Mr. Sloane" and one for "Who's Afraid of Virginia Woolf?" Two "special" Norton Awards bookended the evening. 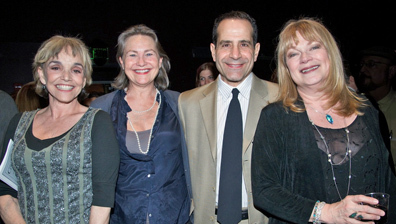 Husband and wife actors Tony Shalhoub and Brooke Adams were in the spotlight as "Guests of Honor," while The Norton Prize for Sustained Excellence went to Karen MacDonald who was praised as "an actress of phenomenal versatility, who for three decades has enriched our stages with indelible characterizations." As the final honoree of the night, MacDonald gave a touching tribute to the many friends, mentors and colleagues who've played an integral part in her life and work. A Special Citation went to Gamm Theatre "which, celebrating its 25th anniversary, has firmly established itself as a theatrical jewel in our region." As well, StageSource presented their "Hero Award" to Michael Maso, managing director of the Huntington Theatre Company. The always welcoming Joyce Kulhawik served as host for the night and kept the evening moving through the 23 presentations. Award categories are listed below, with the winners highlighted in blue. The affable Barry Rocklin once again provided piano accompaniment from the stage. A reception in the Black Box Theater capped the evening and allowed guests, nominees and winners to mix, mingle and bask in the glow of the festivities. The awards are, of course, named for venerable theater critic Elliot Norton.